Chesterfield’s new street pastors will be equipped with life-saving skills when they take to the town centre next month thanks to St John Ambulance. Trainers from the leading first aid charity ran a specialist course for the fledgling pastors as part of their intensive training in the run-up to the August 13 launch. 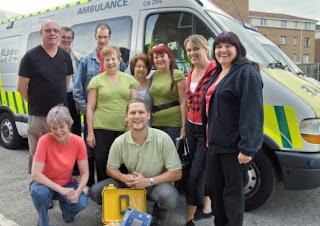 St John Ambulance trainer Antony Owen instructed 25 volunteers from local churches in how to deal with emergencies they might encounter on the streets including severe bleeding, vomiting and chest pains as well as how to resuscitate someone who has stopped breathing. Street pastor Yvonne Birchmore, from Central Methodist Church, said: “First aid is a very important part of what we’ll be doing. We could be the first line of defence and without this someone might die. In Chesterfield a minimum of four street pastors will work in the town centre every Saturday night, from 10pm to 4am, helping late-night revellers to stay safe. They will chat to people, listen, talk and help to keep the peace. Before the scheme gets under way, volunteers are being trained in everything from first aid to alcohol awareness, drug awareness and offensive weapons. St John Ambulance offers a range of first aid training from school classes for children as young as five to workplace sessions and community courses. For more details call the Derbyshire training team on (01246) 200 272.